Xi Series - Productivity on-demand! Built for high-volume applications and harsh environments, Zebra's Xi Series label printers deliver superior print quality and reliability. Boost productivity with faster print and connection speeds, and reduce downtime with early warning. Best suited for: Government, Manufacturing, Logistics, Transportation, Consumer Goods. 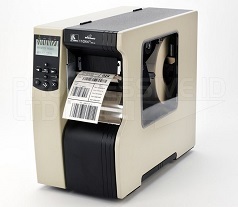 Get more done in less time with a durable and reliable barcode label printer featuring fast print speeds for high-volume applications. Built for the toughest environments. Increase productivity and print high-volume, wide labels on demand or in batch with unmatched performance ideal for compliance, product identification and pallet labeling. Designed for fast printing of chemical drum and other wide-label applications, count on high-performance when you trust the rugged reliability of this thermal label printer.